Justice Minister Shaked the second most popular candidate for premier, would win same number of seats as Netanyahu at helm of Likud. 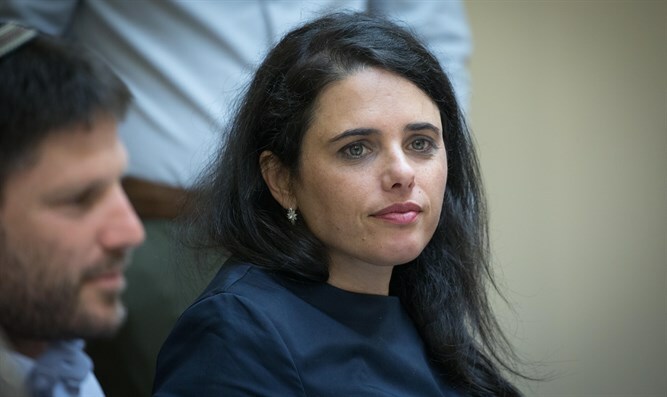 Justice Minister Ayelet Shaked would be a viable candidate for premier at the helm of the Likud, a new poll shows, with the Jewish Home party’s second-in-command leading the Likud to a 33-mandate win if new elections were held today. The poll, conducted by Panels Politics on behalf of Ma’ariv, includes a scenario in which Shaked would leave the Jewish Home for the Likud, and replace incumbent Prime Minister Binyamin Netanyahu as chair of the Likud. In this theoretical scenario, the Likud would win 33 seats – three more than it currently holds – and 15 more than the nearest competitor, Yesh Atid, which would rise from 11 mandates to 18. Shaked’s performance at the helm of the Likud is identical to that of Netanyahu, who would also win 33 seats if he ran for a fifth term as premier. With either Netanyahu or Shaked at the head of the Likud, the Zionist Union, an amalgamation of Labor and the Hatnuah faction, would plummet from the 24 seats it won in 2015 to just 11 mandates, while the far-left Meretz would rise from 5 seats to 7. The predominantly Arab Joint List party would lose 2 seats, falling from 13 to 11, while Finance Minister Moshe Kahlon’s Kulanu would drop by 3, from 10 to 7. In both scenarios, Defense Minister Avigdor Liberman’s Yisrael Beytenu party would win six seats, the same number it won in 2015 but one more seat than it currently possesses, after MK Orly Levy split off from the party in 2016. A party led by Levy would win six seats in a new election, the poll shows. Depending on the leadership of the Likud, the Jewish Home would win either nine seats (with Netanyahu leading the Likud), or eight seats (with Shaked leaving Jewish Home for the Likud). Among the haredi parties, the Sephardic Shas party would win just four seats if Netanyahu remains the candidate for the Likud, barely passing the minimum electoral threshold. If Shaked leads the Likud, however, Shas would win five seats, a drop of two compared to the last election. The United Torah Judaism party would win eight seats in either scenario, an increase of two mandates over its 2015 performance.